Lucky us, we get a fresh beginning. Whether 2013 was your best year yet, your most devastating, or a mix of both, it's over. Done! Time for fresh starts and clean slates. Before we completely move on though, I did promise to try to look back on the shape of 2013 for us. For us 2013 was pretty decent. There was some stress, some worry, some celebration, some adventure. Most of the things we worried about personally didn't end up happening. Most of our lows were second hand; we had dear friends and loved ones face terrible losses and challenges this year. Most of our highs were second hand; we welcomed new family members on both sides, we celebrated graduations and promotions and so much joyful news it was sometimes overwhelming. Even the year in review tool on facebook gave, as all my top stories, photos I'd taken for/of others and news I'd shared about community or family events. My facebook, not my story apparently. For ourselves, life was pretty even-keeled, which is frankly just the way I like it. In the winter, as always, we hibernated and did the bare minimum. We continued lessons. We read books, watched too much tv, and maximized our ability to be still. We snuggled under blankets, cuddled up, ate lots of soup and chili, and survived. I went with the Boy on a field trip to the Legislature Building and Science East, but otherwise we all stayed as close to home as possible. We ventured out in Spring, returning to King's Landing for the annual Sugar Bush Weekend to celebrate the fact that, surely, spring had to be right around the corner. A couple of days later it was Sweetpea's birthday. She continues to be obsessed with all things bunny (and sporting one of her shortest haircuts yet). Before we knew it it was Easter, there were new birds at the feeder, and we felt that winter really was on its way out. We remembered and commemorated new life and the promise of Spring. Barely a weekend to rest and the Princess was off to the New Brunswick DramaFest with her Middle School Drama Club. She performed well, particularly in her hilarious main role (the club is so small that everyone had multiple roles) as Cassie. We were delighted and proud when we saw the performance and our buttons nearly burst when she was awarded "Outstanding Supporting Actor" by the Festival Committee (you can find her if you scroll way down on that awards list). When we came out of theatres and auditoriums after all those festivals, it was full on spring. I took photos of the flowers and trees in bloom, did a little gardening, a little spring cleaning, a little puttering about. I continued with my volunteer duties; wrapping up the Guiding year while simultaneously figuring out camp info, doing year end reports for the Breakfast Program, and generally getting buried in paperwork. The girls and I went to the St. Andrew's United Church Drama and Desserts and laughed ourselves silly, then a couple of weeks later we were off to a nearly rained out Operation Olave, where there was more laughter and silliness. The youngest two participated in Track and Field events at their school and did well there, the Boy gave his Enrichment Triad Presentation with his class, we had an evening of fun at Science East, and I signed us up for a little thing called "The Summer Bucket List", which turned out to be the best thing we did all year. 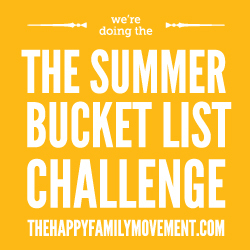 I feel like I did a half-decent job of blogging the summer, thanks to the bucket list participation. I'm also impressed with all we managed to get accomplished despite being a 1-vehicle family again as of June. In June, Sweetpea did her Enrichment Presentation, had a field trip or two, and had HER drama production(s). We had a couple of early heat waves and ate lots of ice cream and froyo. We did up Carl's birthday weekend right, with gorgeous weather and a day in St. Andrew's and a rainy day picnic on his actual birthday. We said adieu to school and schedule, began our waterfall quest, and partied with our friend Cindy. July started with a bang with all the great celebrations at St. Andrew's. A couple of days later it was off to Camp Chip for the girls and I, immediately followed by VBS and a visit from my Mom and Stepdad. It was a really, really busy couple of weeks! It's hard to recall as I sit here with the outside thermometer at -29C, but it got pretty hot and humid and we were happy to take any opportunity we could find to cool off in the water (which just made it excellent waterfall finding weather). We crossed items off our bucket list like crazed fools and sat around like slugs in between adventures. August was taken up mainly by prep for, attendance at, and recovery from the big Provincial BFF Camp at Snider Mountain Ranch. The girls are still talking about the fun they had there and they're each still writing to a friend they made at camp; Sweetpea to a friend from the Minto area and Princess to a friend from PEI. We also got to enjoy part of our Harvey Community Days (but missed the fireworks--BOOO!!) and a visit from my Dad and his family as they moved from Ontario to Newfoundland (guess which province just got bumped up our life bucket list?). We got ready for back to school, had a week unplugged (in addition to the week the girls and I spent unplugged at camp) and bid a sad farewell to an amazing summer. Bonus BFF photos since I never got around to blogging them (and still have to edit more than half). BTW--our world record is official! September meant back to school and, sadly, the end of our bucket list. We still made time for a final waterfall though! We also did some apple picking and had a nice afternoon with some friends from church, checked out the Fredericton Playhouse on Open Doors Fredericton day, and celebrated the Boy's birthday. Oh--and Sweetpea ran a very cold and wet cross country race. The girls agreed to humour me with a little stylized photoshoot and even the Boy came out as we were tidying up for a couple of shots. October was more cross country, a visit to the community from Fred Fox, Camp Chip's birthday party, our annual trip to Hunter Brothers, Night Quest (for the Princess and I), the Princess's 12th birthday, and Hallowe'en shenanigans. November was quieter again, with preparations for Christmas excitement and blessed routine. It got colder and it seems I put the camera away, for I took very few photos. December we got wild again, with the calendar jam-packed with concerts and parties. We had a Craft Show at the school, went on the Home Tour, had the Christmas Cantata, the girls had a Hand-Chime Concert, the elementary school had its Christmas concert...and so on, and so on. We had our Christmas without power and for NYE went to the theatre to see The Hobbit and spent some time visiting with our friend Sister Kadisch. That's our year! It comes out to a very long blog post, yet only skims the surface of what we were up to. Perhaps I'll do a better job of keeping up with our chronicles in the new year. We'll see what it brings!